Duke has provided entertainment and companionship for years. He has tremendous work ethic as he is a working dog. Visit here to see Duke’s antics. He is far from shy and can tell it like it is. 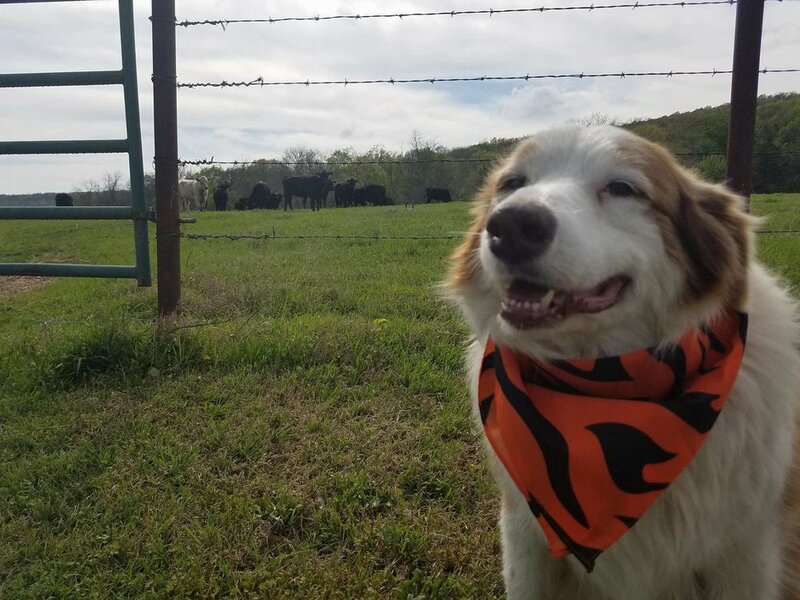 I run a cattle farm for my humans. Sometimes that puts me in a position where I need to influence others. Others would include cats, Jax, Sydney, cows, humans, Mr. Fedex. The list is endless. And exhausting. There are a few things I have discovered. You cannot influence or persuade all cows the same way. My arch enemy is a Limousine named Cyclops. I dunno what happened to her, but she is a giant red cow with one twisted horn. I guess her momma didn’t love her. I don’t think Snowball, the bull, finds that very attractive. Anyway, she and I disagree on everything. For some strange reason she thinks she is in charge. My humans have explained to her often, that is not the case, I, Duke, am. Regardless, she causes problems. Within any work environment there are going to be those that just cause problems. So I’ll explain what I have tried and what works. Hypnosis. Did not work. She didn’t have the attention span to watch me while I lured her into my thoughts. But this totally works on Mr. Fedex as he brings me treats every week now. Brainwashing. She wouldn’t listen to anything I said, so was a no-go. Coercive Persuasion. I had mild success with this. I would bark at her until she moved where I wanted her to. But I think that actually hurt our relationship even more. Mind control. This works on Jax, but not success here. Suggestive. Yep. This is the secret to success. I could continue to bark at her, which I enjoy by the way, but it is exhausting. So I started spending time with her in the fields. We just kinda notice the farm together. Visit a little about the new generation of heifers. They apparently irritate her as well. I try to acknowledge her more often on my security rounds. I don’t get too close, as that one horn is a tad dangerous and she is not one to take accountability for injuries. But over the last year I can tell that we have come to a bit of an understanding. A mutual appreciation of each other. We both have a job to do. So I bark less and she seems to concede more. My advice, don’t always bark, sometimes bend. Delegation - through a few trials and tribulation I've learned to foster and appreciate it. It lets me put my energy where it matters most. Ya see, when my humans brought Jax home for me to manage, I wasn't certain I could teach him a thing. He was young and dumb. He whined all the time. I’m not his momma. Grow up. I had to tell him that often. I was stern. I don’t think my humans understood my management style. My humans actually had counseling sessions with me, I think they even developed an action plan for me. So I realized I had to approach Jax a little different than my mentor, Tank. So I tried it. Sorta. I am responsible for bringing the cows into the piped yard. My human likes me to do that every few weeks. It’s hard work, because I don’t speak cow. For some reason they don’t like the piped yard. I don’t care, it’s my job. For a long time it was just me and my human bringing cows into piped yard. My human thought he knew what he was doing, but I had to come behind him and monitor the results. As more cows came to my farm, I started to realize it took longer to get the same results. Now I have Jax’s help. I had to teach him the cow sneaky tricks. Sometimes the older cows act like they are going to cooperate. It’s a rouse. You can’t trust cows, just look into their eyes. One of my humans wrote about untrustworthy cows. Read her book. They just wait on you to let down your guard, which I have not done since a pup myself, and they run. It’s hard work chasing cows. I found that Jax can do that and still be able to bark. So I have decided to delegate all running after cow to him. That lets me keep an eye on the herd. It works for us. So why would anyone have a problem with delegating??? Celebrate and educate the pups. Cats. I’m surrounded by cats. I don’t know the purpose of cats. I work hard every day. I help my human bring cows into the piped field. I chase deer off of my human’s yard. He must hate them as sometimes he aims a gun at them. I alert my humans of cars and trucks. My humans like this as they praise me by saying Shhh….. Definitely important as they don’t say that to Jax or Sydney. If a new human comes to my house I introduce myself to them and make certain they understand I am watching them. One bad move and I’ll have to ask them to leave. You see, I’m in charge of security. My humans are too trusting. But cats. What purpose do they provide? They have no work ethic. They can’t chase cows. They don’t care about the new humans that come to the door. I do get confused as my humans provide food for them. I disagree. Let them find it on their own. There are essentially three types of cats I have discovered. There are the super excited chatty kind. That cat seems to think everyone is their friend and they want to be in the middle of everything. My advice for that kind of cat is to know your audience. Not all of us care what you think. The second type of cat is lazy. They just wander from one location to the other and provide nothing usable. My advice for that cat is find a purpose and invest themselves in that purpose. Be known for something. The third type of cat is pissed off all the time. They walk around with an attitude. Mad at the world. I suspect because they are best friends with chatty cat. They just need peace and quiet. My advice, find a happy place. Sometimes I wonder if humans are like cats.